When the mall crowds pick up, people start frying turkeys, traveling to grandmas, and families come together, inevitably there will be an increase in 911 emergency calls. Lest we forget that there are several people who don’t get to spend the holiday(s) with their families, friends or loved ones. Yes, 911 dispatchers! So, on a much lighter note, while dialing 911 is a VERY serious thing, we wanted to shed some light on what to do in case of a “TURKEY” emergency! Did you know that there is a Butterball Turkey Talk hotline? (1-800-BUTTERBALL) (Sort of like a turkey 911 line) That’s right; it all started in 1981 when 11,000 people called during November and December. Having Turkey Trauma? Not to fear, most disasters can be avoided this Thanksgiving with a quick call to the turkey hotline. Staffed by about 50 food experts, the hotline used to be staffed by mostly women, but now men are also a part of the Butterball turkey hotline. This makes sense, because according to Butterball CEO Rod Brenneman, one in four calls received at the Turkey Talk Line hotline are from men. 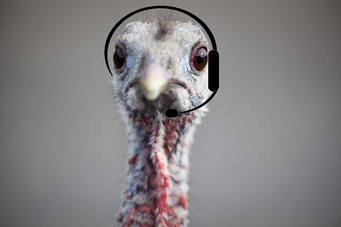 Fast forward to 2014, how many calls do you think the turkey hotline gets on Thanksgiving Day? The answer: well over 10,000 phone calls, plus thousands more questions on social media. Yes, if you are more of a visual learner, Butterball is on social media; loaded with great pictures ideas and more; check out their Facebook, Twitter, Pinterest, and Instagram pages. (Each year the company assists more than 3 million cooks in November and December.) Most calls range from two minutes to a half hour. One of the most frequently asked questions received is about the thawing of your turkey. Once a man called the hotline, panicked, because he'd buried his turkey in the snow in his yard, having run out of room in his freezer—then couldn't relocate it. While there is no advice to fix some things (Wink…wink I think you know what I mean), the hotline did advise that you can defrost a turkey more quickly by thawing it in cold water. Change water every 30 minutes to keep the turkey chilled. We want to sincerely wish all 911 dispatchers a very safe, happy and uneventful Thanksgiving. And remember, while calling 911 in case of a real emergency is very serious, these Turkey Talk-Line stories aren’t and hopefully will give you something to laugh about this Thanksgiving!